Setup Area: screen needs to be setup on level area measuring at least 26 by 12 feet. 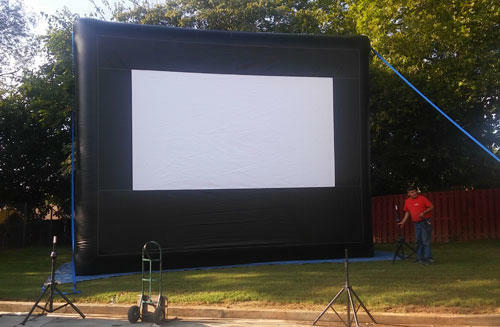 Bring the party out into the fresh air with our outdoor cinema package...watch your favorite classic movie or the big game on the big screen! 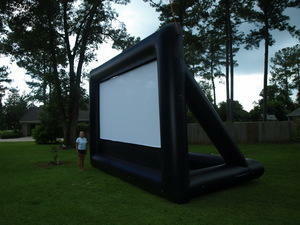 This movie screen measures 24 feet long by 19 feet high (viewable screen 16x9) and is ideal for up to 300 viewers. We use top quality projectors and amplified audio to make your event a night to remember. Perfect for community, church, and school events. Best of all, we provide an attendant to operate the system and allow you to relax and enjoy the show! NOTE** Outdoor movies cannot be viewed during the day. Must be dark in order to use. Note about movie copyrights: As the equipment provider, we do not provide the licensing to view movies in public settings. You may contact either Swank (www.swank.com) or Criterion Pictures (www.criterionpicusa.com) to obtain any necessary copyrights for your event.